Currently, there is a dispute about what colors should be standard for breaker status colors (panel LEDs, HMI, etc.). Does anyone have any thoughts on this or have had experienced on such matter in the past? 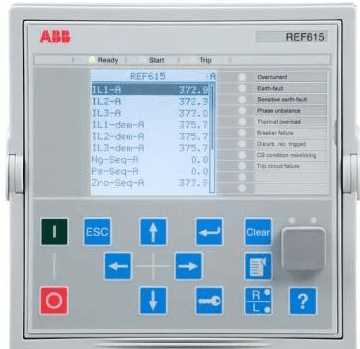 A reference to a standard such as IEC, IEEE or ANSI might be helpful as well? In advance many thanks for any help. I believe this has been discussed on here before, try doing a search for the thread. If i remember correctly, it was said that this is mainly an industry/client preference. Where i am from, Green means safe so it would be for breaker open and red when it is not safe (closed). Amber would be lock out. Though i've had clients that use it for Maintenance mode, and blue for Lock out. I hate this. I prefer words since groups and companies do this differently. Agreed Hamburger - capitally idiotic. There is a large number of people who see red and green as the same exact grey. On something this serious they should all be white and light up under/over a clear text description and if possible an additional clear graphic. Green is typically open, Red is typically closed. Way back when Green was closed and red was open. There is no single recognized standard in the good old USA. Consistent positioning of lights and signage critically important. In the utility and power generation industries: RED invariably is used for energized (breaker closed) and GREEN is used for de-energized or OPEN. In general industry, GREEN very often means RUNNING and RED means STOPPED or OFF. This is still true. As far as other colors and functions - there is absolutely NO STANDARD. The key is consistency. I have a lot of scar tissue on this topic - ask me anything. Is that why we seem to have a Brexit? I'm used to seeing ANSI devices with Red=closed, Green=open. And IEC devices with Green=closed, Red=open. 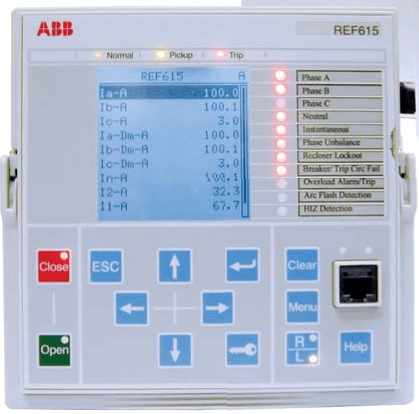 Here are the ANSI and IEC version of the same ABB relay for reference. We specifically train our employees to understand this is different from region to region. We use green for open and red for closed. I've heard when potential new operators are being interviewed they are often tricked into a color blindness test. Here in Canada, obviously you wouldn't be able to ask someone directly about a disability - even if the disability could lead to devastating consequences - so interviewees may be asked to 'pass the red pen' or something like that. I have no idea if this is really true or not, but the rumors about it are strong. also... we use yellow for 'state unknown.' You can use this if you know the pallet info is wrong and it'll also pick-up during disconnect switch travel depending on how the pallets are set up. The yellow is nice cause it will tell you that the switch isn't open or close yet, so the safe assumption is that it's still moving. if it stays yellow than you send someone to check. IEC gear in Madagascar designed by North American company had interesting 6.6kV Switchgear. Valves in the plant had green lights for open or fluid flowing and red for closed (Green go, Red Stopped. Pump motors followed the same scheme. Switchgear followed Red= Energized or Closed and Green = Off or Safe. Adjacent breakers in the same 6.6 kV lineup had green lights for motor breaker closed and pump running, next to a closed transformer feeder breaker with Red for closed and Green for open. Tried to change it but couldn't. At least signs and nameplates were in three languages. In utility-owned power plants we designed - red = breaker closed, red = motor RUNNING, red = valve OPEN. It was internally consistent. When I was working on water treatment and wastewater plants, generally green = Motor running, but not always. Of course, before LED lights, a large fraction of the indicating lamps were always burned out anyway. So annoying to visit a facility and find half of the red lights in the switchgear non-functioning. So annoying to visit a facility and find half of the red lights in the switchgear non-functioning. Oh sooo true. Half the time they're obscure bulbs and even if you have one half the sockets are baked to death and faulty. Here is one of the old threads on this, with a link to another one in this one. switchgears use the ''safety '' approach as RED is Closed and GREEN is open. Some custommers use the ''functional'' approach here. MCC's use the ''functional'' approach as RED means OFF ans green means ON. My first employer hated christmas trees, so he would go for only one white light in MCC's. If it's off, it's safe. And how did he distinguish off from burnt out?